How do you celebrate Christmas? If you’re an otaku, then your festivities probably include setting up your Sailor Moon Christmas tree, baking Naruto-shaped cookies, watching Christmas anime specials, mailing anime-themed greeting cards to all your family and friends, and singing Vocaloid carols around your neighborhood. No matter how you celebrate, though, it’s never too late to start a new tradition. 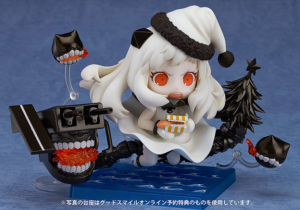 If you’re looking for a fresh way to make the winter season memorable, check out these Christmas anime figures that you can bring home just in time for the holidays! Even the Survey Corps gets into the Christmas spirit, and it looks like Eren has a “colossal” amount of presents to deliver! Find him bundled with the limited-edition 18th volume of the Attack on Titan manga, being released December 9th, and bring home the most “titanic” member of the Scouts for an unforgettable winter season. Too bad there’s not an actual Christmas anime special to complement Eren’s new duds. Summoned by the music of the Lily of the Valley, Miku transforms into a kawaii snow fairy for the 6th anniversary edition of the Snow Miku line of anime figures. Her rabbit friend, Yukine, joins her to help welcome in a late winter and early spring. 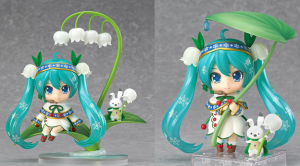 Bedazzled with delicate snowflakes, holly leaves, and seasonal flowers, Miku can be posed with her umbrella-like leaf, or perched on her special Lily of the Valley flower base. Welcome her into your home to remind you of the promise of spring during the long winter months! If the Christmastime Chibi look doesn’t warm your heart, then be sure to check out Snow Miku’s alternative Figma figurine, also crafted by the Good Smile Company. 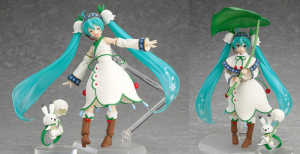 The winter songstress comes with her rabbit Yukine, her leaf umbrella, Lily of the Valley-shaped bells, and several alternative expressions that capture Miku’s playful and optimistic charm. 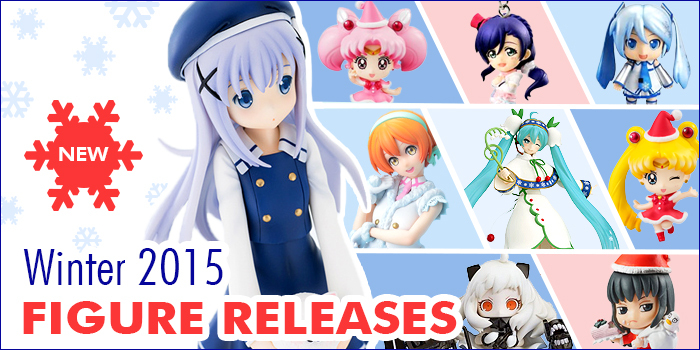 Get ready to ring in a new winter season with Mikudayo! The Vocaloid star’s newest winter look reflects her status as a pop idol, with snowflakes decorating her twin-tailed hair and tie. Miku comes with her favorite foods—oden and salmon sushi—and two special products available in Japan—Snow Miku caramel (sold at the New Chitose Airport) and “triple berry parfait with premium soft-serve ice cream made from the milk of Shibecha brown Swiss cattle” (available at the MIRAI.ST café). Your favorite Sailor Senshi celebrate the holidays with Christmastime fashion in this upcoming release of Christmas anime figures from Megahouse! 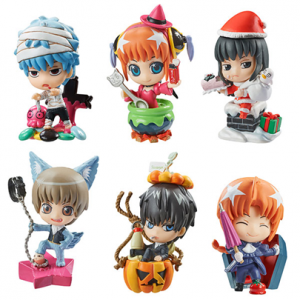 The chibi-sized set includes Sailor Moon, Sailor Chibimoon, Sailor Mercury, Sailor Mars, Sailor Jupiter, and Sailor Venus; and each Sailor Scout features her own unique way of ringing in the winter season—whether by singing carols, lighting candles, delivering presents, or building an adorable snowman Artemis. Make the magic of Sailor Moon a part of your holiday festivities this November! Is it Christmas or Halloween? The stars of Gintama aren’t quite sure, but thanks to this 6-pack collection by Petit Chara Land, you can celebrate both holidays at once! Commemorate the passing of autumn and the advent of winter with these miniatures of your favorite alien-fighting samurai. The rarest of the new anime figures on our list, Kafuu’s unique winter uniform was only available as a summer exclusive at the 2015 Wonder Festival in Japan. However, you’ll likely be able to find her for sale through a proxy shipping and bidding service. Add the quietest member of the Rabbit House café to your figurine collection to remind you to drink your favorite hot beverage during the cold winter months! Can’t get “Snow Halation” out of your head? Embrace the icy beat with this series of Love Live holiday-themed anime figures from SEGA. They’re only available as game prizes, which means you’ll have to go through a proxy shipping and bidding service, such as FROM JAPAN, in order to obtain them, but that search only makes them even more rewarding to own. Collect all nine School Idols and relive the wintery wonderland of Love Live’s most popular song! The last two characters in the set will take the retail stage this December. If you want to show off your Love Live… er… love everywhere you go, then these “Snow Halation” keychains are the perfect fit for you. Get into the Christmas anime spirit by hooking your favorite singers onto your backpack, purse, or jeans; or display these chibis at home in their personalized, crystalline stands. Add them to your winter decorum this December. Even Kan Colle’s Abysmal warship can’t resist getting into the Christmas spirit! The Northern Princess looks dangerously adorable in Nendoroid form, weighing anchor with two aircraft and the Zero airplane to back her up. Put on her Santa hat and set up her shadowy Christmas tree to recreate her appearance in the Kantai Collection Christmas event of 2014. With Christmas anime figures like these, there’s no reason that your favorite Japanese pop culture characters can’t complement the holiday season. This winter, whether you’re making a purchase for yourself, or buying a gift for a friend, don’t forget to give the gift of figurines!